I had never seen nor eaten this rich, flaky, nutty pastry dessert until a college roommate of mine showed me how to make it. Jewels learned this recipe from her Armenian mother-in-law, Pahklava, the old fashioned way....without measuring spoons or cups. She carefully measured the ingredients and shared her recipe with me. I tell you, this dessert is to die for. Seriously. It is so easy to make. People will think you slaved for hours to make this. A simple syrup is made with sugar and water over high heat. 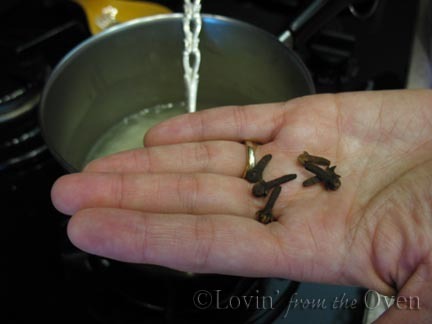 Whole cloves are added, which will be removed later. Freshly squeezed lemon and lime juice are added to the syrup and brought to a rapid boil. Heat is turned off, cloves are removed, and the syrup is set aside to cool. Walnuts are chopped into small pieces. You do not want walnut "dust," so don't chop them too fine. 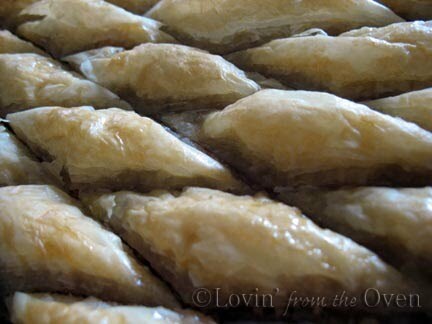 Large pieces tend to fall out of the baklava, and small pieces work better. Sort out the larger pieces and chop them to equal size. 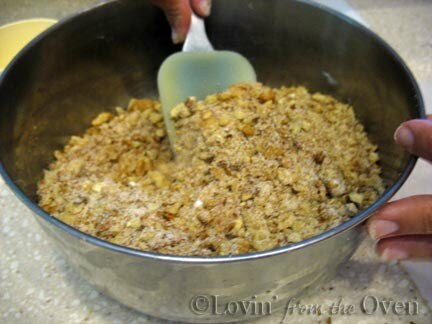 Mix chopped walnuts in with sugar, cinnamon and cloves (or nutmeg, if you prefer). Use a large 17"x12" baking sheet (do not use Silpat or a non-stick pan, as you will be using a knife to cut on the sheet). Melt a boatload of butter. Not margarine. Butter. The good stuff. O.K., only 1 1/2 cups. Make sure it's salted butter. Using a pastry brush, brush melted butter all inside the baking sheet. This recipe uses phyllo (fillo) dough that can be found in the freezer section of your grocery store. You will want to put it in the fridge overnight to thaw out. Bring the phyllo dough out at room temp for about 2 hours before starting. Take your thawed out phyllo (fillo) dough and carefully unfold it. 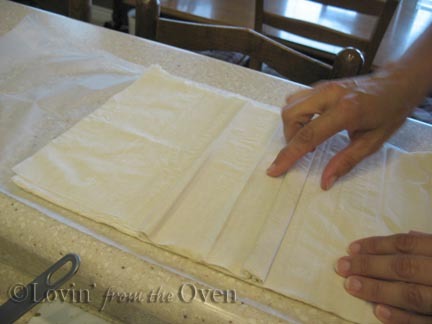 Cover the dough plastic wrap or a lightly damp towel to keep dough from drying out. With both of us working quickly together, we didn't need the towel. Don't throw away the box. Cut the skinny side strip off the box and save it. You'll see what she does with it...it's so cool. Place 2 sheets of phyllo dough flat onto the pan. 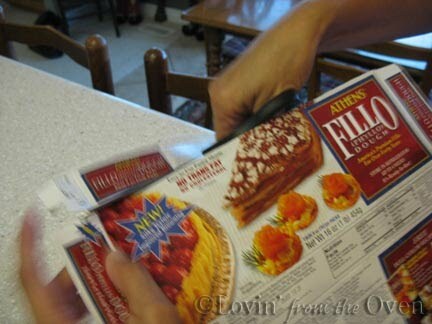 You may need to fold over one edge to have it fit flat into the pan. Place another 2 sheets of phyllo dough side by side with the other 2 sheets. Fold over one edge, if necessary. 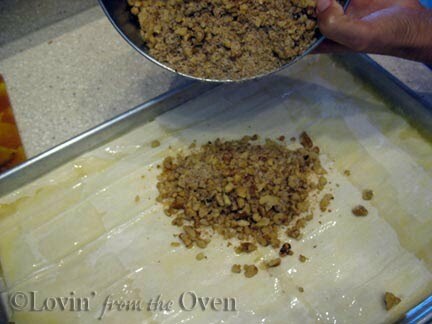 Lay 2 more sheets of phyllo dough on top and fold the edge on the opposite side, so your baklava won't be lopsided. Repeat, alternating folded sides, until you have used half of your phyllo dough. Now's the time to add your walnuts. 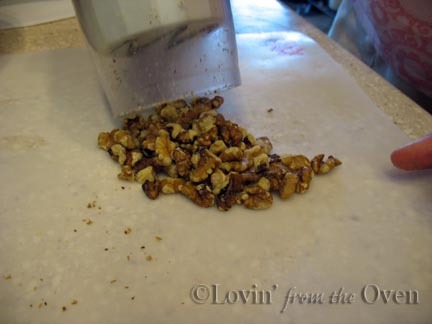 Spread the walnuts evenly over the pan, pressing down. Top with 2 sheets of phyllo dough and butter the top. If you are folding the ends, remember to alternate folding the sides to create an even layer. Phyllo dough, fold end, butter top. Repeat until all of your dough is used. Top layer should be folded under, for an attractive appearance. Do not butter top layer yet! 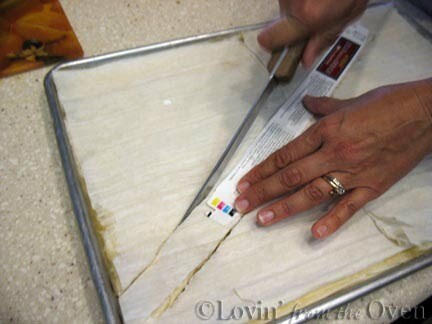 Take the side strip that you cut from the phyllo dough box and use it as your ruler. Cool, huh? Using a sharp knife and your ruler on the diagonal, cut slowly, moving the knife up and down as you go. Be sure to cut through all the layers at once. After your diagonal cuts are made, use your paper ruler to make your straight horizontal cuts. 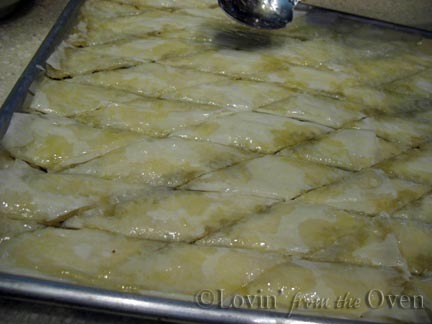 When cutting is complete, each piece of baklava will have a beautiful diamond shape! Drizzle remaining butter (remelt butter if necessary) over the top. 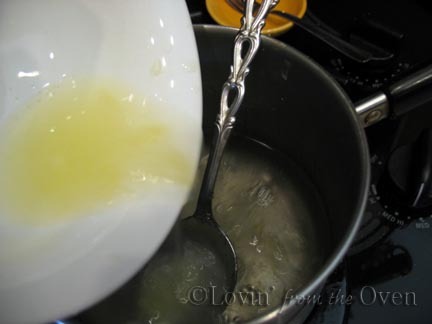 Using the back of a large spoon, slowly and carefully spread the melted butter over the tops of each piece. Bake the baklava till lightly golden. 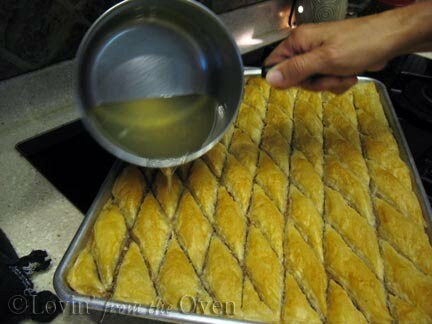 Pour the cooled syrup evenly all over the hot baklava. Let sit for a couple of hours before eating. I know, I know. I hate waiting, but it's worth it! 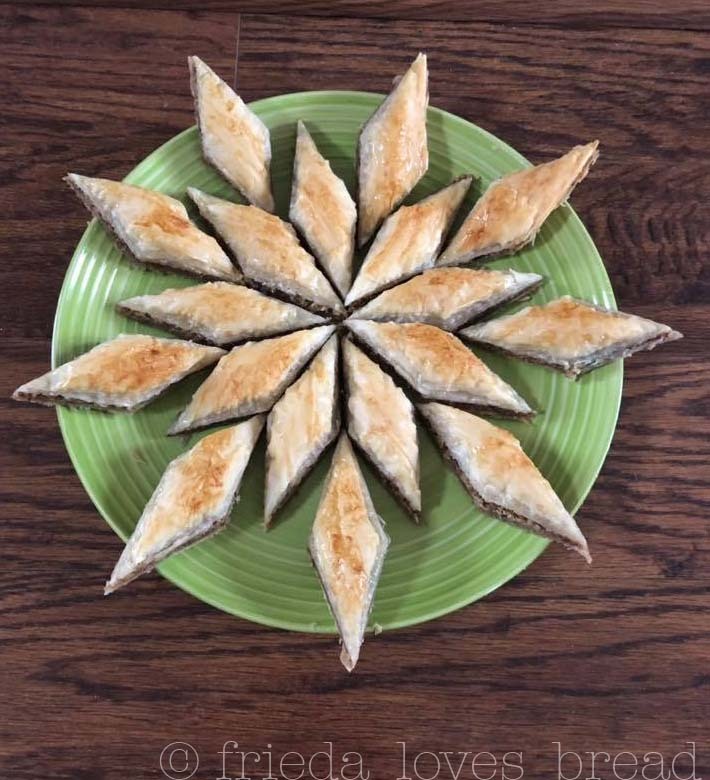 Since trying this recipe, I have sampled baklava at a Greek restaurant in California and the Greek Festival in Salt Lake City. While they were good, I still prefer Jewel's recipe. Some people use rose water (too perfume-y) or honey (too sweet and sticky), or use TONS of walnuts in their recipe. Jewel's recipe has the perfect combination and balance of citrus-savory-nutty without being overly sweet. Crispy, buttery layers of thin pastry hold together a nutty, spiced filling that is covered with a citrus light syrup that soaks through every layer. 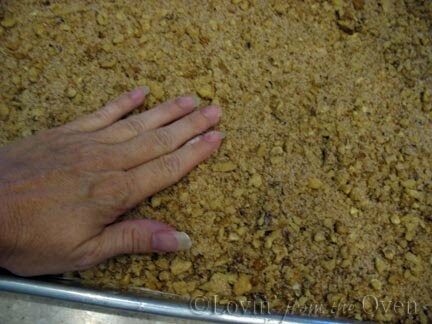 This makes a large 13x18 pan, large enough for a gathering or party. 1. Combine water, sugar and whole cloves in a medium saucepan over high heat.2. Pour lemon & lime juices in the mixture as it's heating. Stir continually until it reaches a rapid boil. Remove syrup from heat and set aside.3. In a separate mixing bowl, make the filling by combining chopped walnuts, sugar, cinnamon and ground cloves (or nutmeg) Set aside.4. 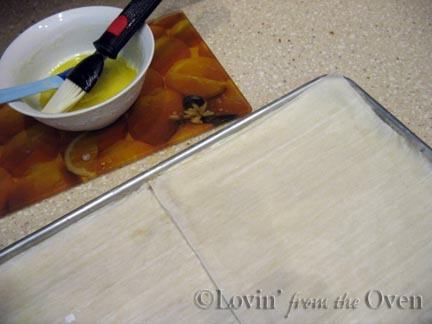 Brush a 13"x18" baking sheet with melted butter.5. 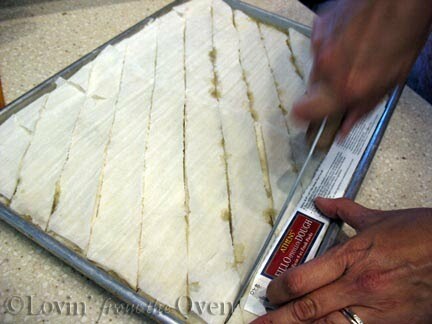 Begin the assembly by laying 2 sheets of phyllo dough crosswise on the pan, folding the edge to fit. 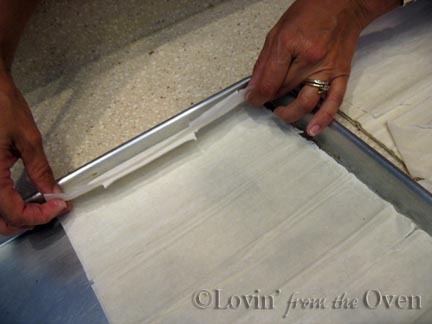 Lay 2 sheets of phyllo next to the other sheet (side by side), folding the edge to fit the pan.6. Using a pastry brush, lightly brush the top of phyllo dough with melted butter. 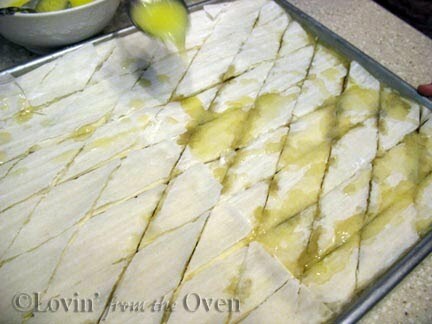 Repeat layers, using 2 sheets at a time, until half of the phyllo dough is used.7. Spread walnut filling mixture on top. 8. Repeat the phyllo/butter process, using the remaining phyllo dough. 9. 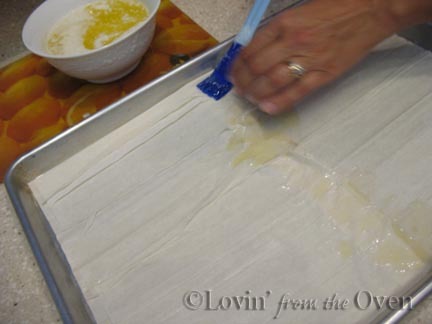 Fold the top (last) layer of phyllo dough UNDER, instead of over, for a neater appearance. 10. 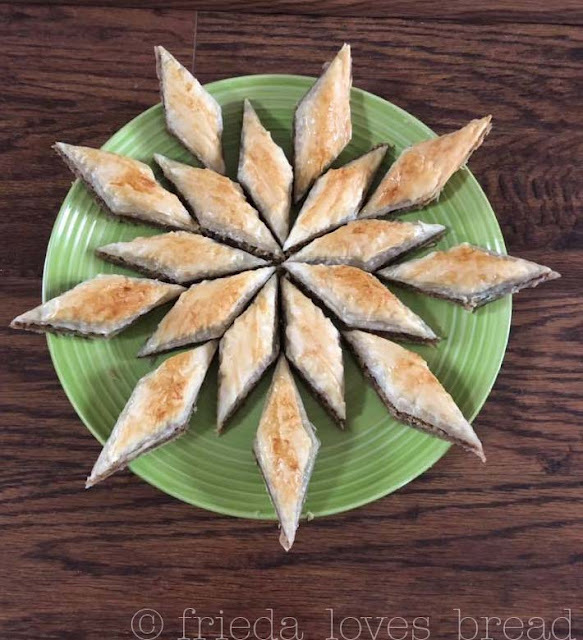 Cut out the side of the phyllo box and using it as a ruler, use a sharp knife to make diagonal cuts with an up-and-down motion, then make straight horizontal cuts for a diamond baklava shape. 11. Drizzle the remaining melted butter over the top and gently use the back of a spoon to spread the butter. 12. Bake in a preheated 350°F oven for 30 minutes, or till light and golden. 13. 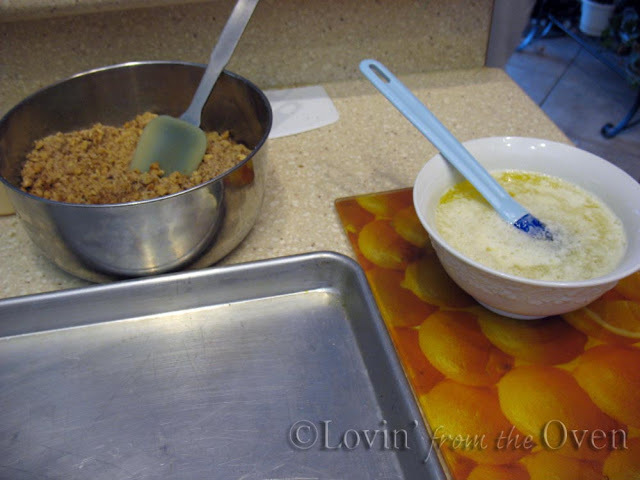 Remove the cloves from the cooled syrup and drizzle the cooled syrup over the hot baklava. Let sit for 2 hours before serving. paul and savannah would love me forever if I learned to make this! Yum! One of my favorite desserts. Love the step by step pictures. This armenian girl thinks you have it correct!